The Pacific Princess is a cruise ship owned and operated by Princess Cruises line. The vessel, along with sister ship Coral Princess, was launched in 2003. 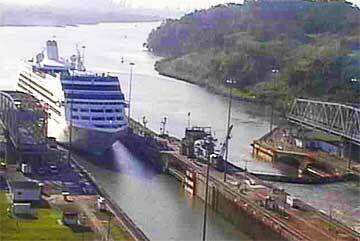 The Coral Princess and Island Princess are the only two Panamax ships operated by Princess Cruises. 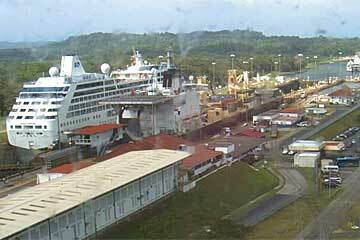 The Pacific Princess is seen here on January 7th 2010 doing a Panama Canal transit entering the Canal from the Pacific side from Panama City, passing the Miraflores Locks system and the Gatun Lake and then back out trough the Gatun Locks to the Atlantic. 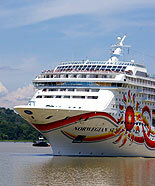 Some of the Pacific Princess Destinations are: Alaska, the Caribbean, Mexico, Panama Canal and more. 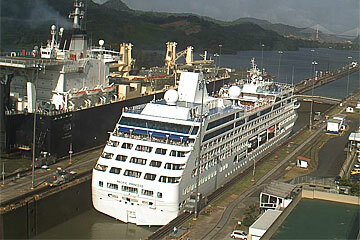 Link to the Princess Cruises Online Live Cams.